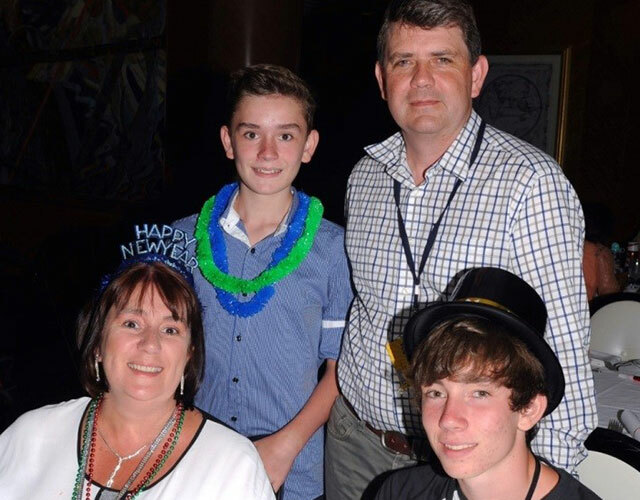 Lisa and John have kindly written the article below for Trade Secrets on their family, working life, holidays and the long term relationship they have had with our company over the last 20 years – we greatly appreciate their contribution to this edition of Trade Secrets. I was recommended to GFM in the early 90’s as I was looking for a superannuation provider. I was moving jobs and didn’t want to end up with several super accounts. John and I were married in 1996. He too joined GFM. Both John and I work in the telecommunications industry. We worked together for the first 5 years. I then went out on my own and John worked for Communications Australia and is now with Optus. We have two boys, Nick (17) and Matt (14). We enjoy caravanning over the summer and the boys enjoy jet skiing and water skiing. Nick is currently in Year 11 at Caulfield Grammar School, Wheelers Hill. He enjoys Hockey, Karate and Parkour. He has aspirations of becoming a movie stunt man when he finishes school next year. Matt is in Year 8 also at Caulfield Grammar, he enjoys playing the violin and listening to music. We have been with GFM for some 20 years. We have found the entire team wonderful to work with. James has looked after us for most of the time we have been with GFM and he has done an amazing job. He has been very patient with us as we need lots of help. We are looking at a long term investment plan as we are still in out 40’s (albeit just). GFM have helped tailor a portfolio that will take us into the future. Since having children, we were really keen to set up our futures financially but unsure how to achieve this. James presented us with a number of different options and tailored a portfolio that suited our long term financial objectives. We have to say that having the professional advice and guidance from James has kept us on track with our long term plan. We are very happy with the returns of our portfolio and appreciate the value of professional advice. I remember when we set up our investment portfolio, markets were volatile and it was a rocky start. James was there to support and guide us through the difficult times and we are very glad that we stuck to the long term plan rather than panic. We enjoy catching up with James for our regular meetings to review our portfolio and financial position. We would not hesitate in recommending GFM. They take the time to get to know you and help you all the way with planning for the future.